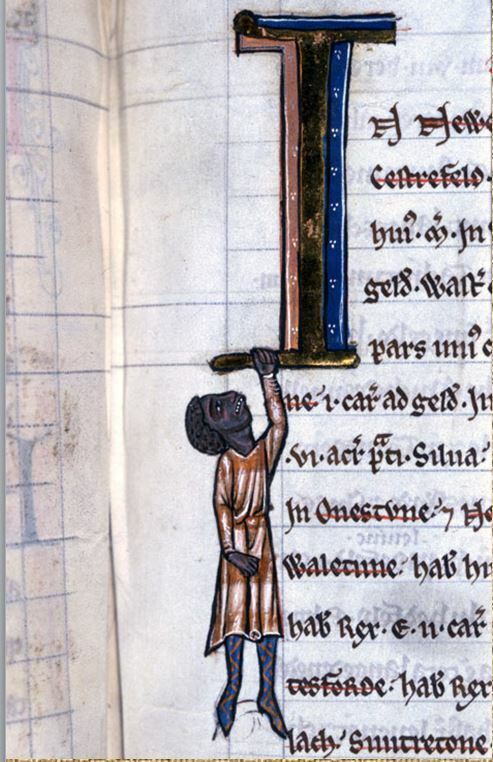 Moving to the Middle Ages, a 1241 Derbyshire version of the Domesday Book has the figure of a Black man hanging from an initial letter on one of its pages. Perhaps the artist had seen Black people, perhaps not. It is not necessarily positive or negative. However, the fact that a Black man is in a book listing people and land means that the artist was at least aware of the existence of African people. He is wearing a short tunic (a sign of low status) and striped clothing (often a sign of a troublemaker), so it may be a negative portrayal of someone disruptive. On the other hand, it may indicate that Black people were present doing useful work. Or perhaps the artist has just chosen an eyecatching image alongside all the others in the book of mythical animals and long-dead people from history. We cannot know. 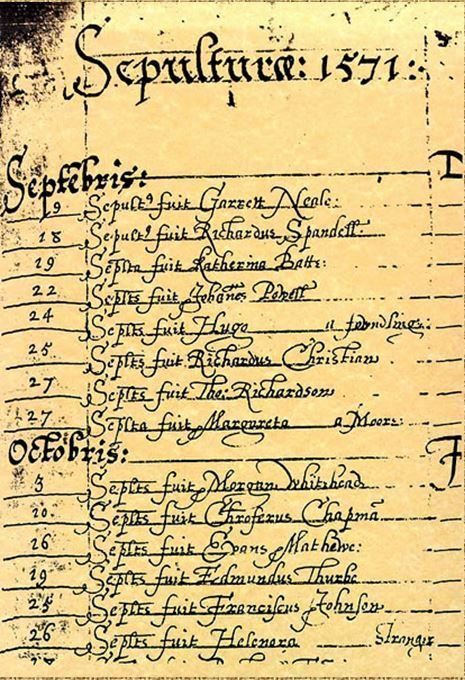 ‘Inde’ called Jacobus Black (in Dartmouth, Devon) and Benedictus and Antonia Calaman (in Bishopsgate, London). Did ‘Inde’ mean India, or Africa, or somewhere else? Nevertheless, even if many people in late medieval England did not come across Africans, Asians, Muslims or Jews they certainly knew about them and their worlds. Books from all over England were full of stories about Saracens, Muslims, Chinese, Africans, Jews, Brahmins and Zoroastrians. Shops were full of spices from Arabia, Persia, India, Sri Lanka, China, Thailand, Moluccas and Indonesia, being sold at prices that ordinary people could afford. Crusader knights brought back many goods and ideas from the Muslim East. On the other hand, the politician Sir Thomas More watched the arrival of Katherine of Aragon’s attendants and commented: “Good heavens - what a sight! If you had seen it I am afraid you would have burst with laughter, they were ludicrous... hunchbacked, undersized, barefoot pygmy Ethiopians. 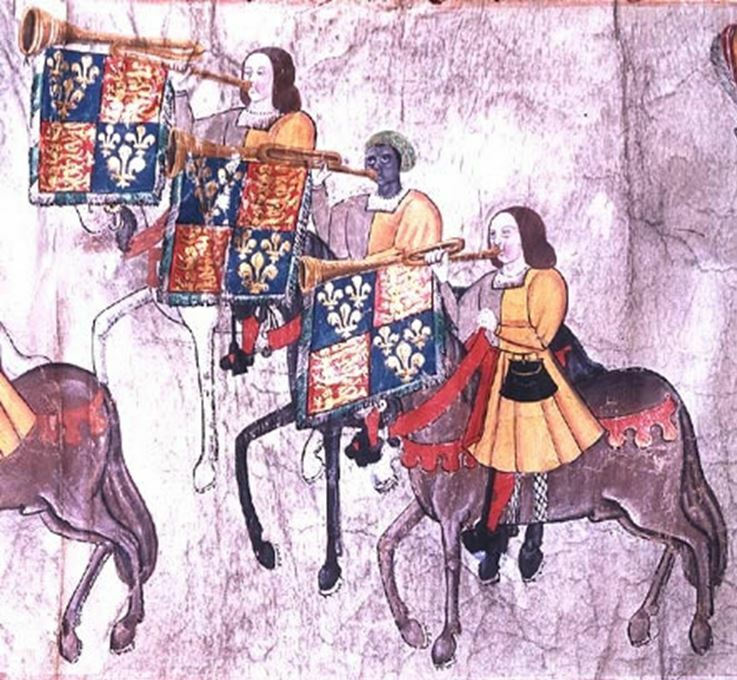 If you had seen them you would have thought they were refugees from hell.” We cannot be sure whether he was commenting on Black servants or darker skinned Spaniards, but his language shows that negative attitudes to Black skin existed. Meanwhile Sir John Hawkins and Sir Francis Drake were beginning their involvement in the trade in enslaved Africans.